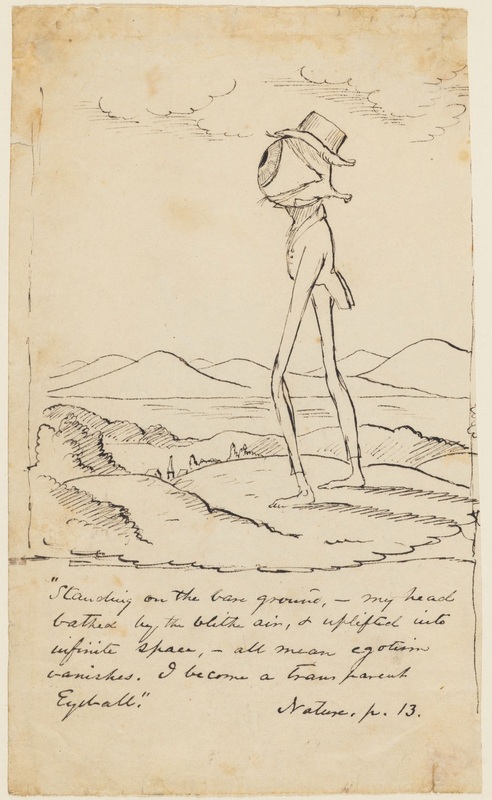 Among the American Transcendentalists, artist-poet Christopher Cranch had the greatest talent for caricature. This oft-reprinted cartoon of a famous/infamous Ralph Waldo Emerson passage (“I become a transparent eye-ball. I am nothing, I see all”) is one of Cranch’s several droll renderings of hyperbolic passages in Emerson’s Nature (1836). The multitude of critics who have weighed in on this passage often misread Cranch’s friendly spoof as savage satire, and/or miss the possibility of lightheartedness in the passage itself, and/or overread it as an assertion of human will to dominate nature through the power of the all-seeing eye.